Two decades ago, nearly one-sixth of the population was forcibly expelled. How did King Wangchuck escape any real censure? Dhimal, his wife and five young children decided to leave. They had heard of people being killed in neighboring villages. He thought he would return in a few weeks, when things settled down. Before trekking toward the Indian border, he released his cattle. By 1992 an estimated 80,000 Bhutanese of Nepali ancestry had been pushed across the Bhutanese border into Indian territory. There, Indian army trucks immediately transported them to the Mechi River and pushed them across the border into Nepal. These refugees constituted at least 15 percent of Bhutan’s estimated population of 550,000. Stranded in the open on the Mechi River bank just inside Nepal, the refugees were not exactly welcomed by their ancestral compatriots. The government in Kathmandu deemed the refugees citizens of Bhutan and requested assistance from the United Nations High Commissioner for Refugees (UNHCR). Eventually, seven refugee camps were built in the southeastern districts of Jhapa and Morang, where the UN’s World Food Program fed them a daily ration. But the government of Nepal declined to issue work permits to the refugees. 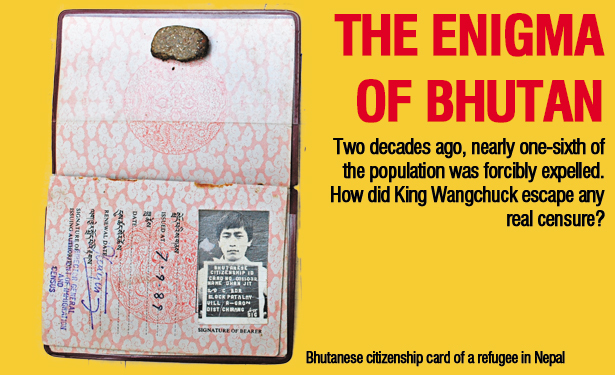 And so there the Bhutanese refugees languished for nearly two decades. By 2007, because of natural population growth, approximately 108,000 refugees lived in the seven camps. In that year, the US ambassador to Nepal, James Moriarty, brokered an agreement to resettle them in several Western countries. Astonishingly, more than 60,000 Bhutanese—many of them peasants like Dilli Ram Dhimal and his family—have already been resettled abroad. The vast majority, more than 50,000, have gone to the United States, with the rest resettling in Australia, Canada, Denmark, the Netherlands, New Zealand, Norway and Britain. By any definition, what happened in Bhutan in the years 1989–93 was ethnic cleansing. The Bhutanese government denies this and has refused to repatriate any of those forcibly expelled. By all accounts, the problem began when the royal family was startled to learn from a government census in 1988 that the Nepali-speaking Lhotshampas (literally, “southern people”) of southern Bhutan were threatening to become a majority. In response, King Jigme Singye Wangchuck promulgated a series of edicts that he said would preserve Bhutan’s cultural heritage. He defined this national culture, however, as Drukpa—the culture of the descendants of migrants from Tibet who practice Mahayana Buddhism and speak the Dzongkha language. The Drukpas have certainly been the dominant, ruling ethnic group in Bhutan for hundreds of years, but up until the 1980s Bhutan was a multiethnic society that included the Sharchops (also originally from Tibet), the Lhotshampas and more than a dozen other linguistic, ethnic and religious groups. On January 6, 1989, the 33-year-old king proclaimed a policy of “One Nation, One People.” Henceforth, it seemed that by virtue of a royal edict all Bhutanese would have to dress and speak like Drukpas. The teaching of Nepali to Lhotshampa schoolchildren was banned. They would have to learn Dzongkha. All citizens would also have to wear Drukpa attire, the gho coat for men and the kira for women. A recent citizenship law had required the Lhotshampas to produce pre-1958 tax receipts to prove that they were not illegal immigrants. For approximately eighteen months after the demonstrations ethnic Nepalis were at the greatest risk of gross physical abuse. Experience of such treatment, or the threat or fear of being subjected to it, was commonly cited by refugees who left the country during this period as the primary motivation for doing so. Since then, the level of serious physical abuse has declined significantly, although cases of torture and ill-treatment in police stations and prisons in the south continue to be reported. The arrest of ethnic Nepalis also continues, albeit on a much smaller scale, but refugees state that many of those who are detained are released only after specifically agreeing to leave the country. With the international community preoccupied with other crises, King Wangchuck escaped any real censure from the international community. How did he get so lucky? On a recent trip to Bhutan I had the good fortune to sit next to Queen Wangchuck at India House, the elegant official residence of Indian Ambassador Pavan Varma. She was so lovely, so charming and so articulate that it would have been rude to inquire about the events of twenty years ago. Neither did I have the courage to query the new king, His Majesty Dasho Jigme Khesar Namgyel Wangchuck, when we were briefly introduced a few minutes later at the same party. Moreover, I thought to myself, it would have seemed as though I was interrogating him for the sins of his father. At 31, the young king is even more charismatic than the Queen Mother. Educated at Phillips Academy in Andover, Wheaton College and Oxford, Khesar Wangchuck became king in 2006 when his father abruptly decided to abdicate at the age of only 50. Both father and son—colloquially referred to as K4 and K5 because they are respectively the fourth and fifth in the Wangchuck dynasty dating back to 1907—have guided the country toward a quasi-constitutional monarchy. Fair National Assembly elections were held in 2008—the royalist party captured forty-four out of the forty-seven seats, even though the very loyal opposition polled about 33 percent of the popular vote in a first-past-the-post electoral system. The monarchy still wields enormous influence. The Wangchuck dynasty thus seems a model of good governance. Over the past half-century the monarchy has implemented methodical and transparently rational steps to develop the kingdom’s economy. It has pragmatically allowed corporations from India, its giant neighbor to the south, to exploit its tremendous hydropower resources. The literacy rate is above 60 percent—nearly everyone in Thimphu seems to speak flawless English. The streets of Thimphu and other towns are clean, and the tap water is potable—a rarity in South Asia. Relatively few tourists visit, but that’s because the Wangchucks decided long ago that they want only the high-spending, boutique tourist trade. To get a tourist visa one must plunk down in advance more than $200 per day. As developing countries go, Bhutan seems to be doing everything smartly. Bhutanese officials are quick to point out that there are still Nepali-speaking Lhotshampas in their midst. The government won’t specify, but they probably still constitute 20–25 percent of the population. In public, these Lhotshampas conform to the Drukpa attire, and if they are at all educated they speak both Dzongkha and English. A handful of Lhotshampas were elected to the National Assembly in 2008. But the Nepali speakers I talked with indicate that there is a glass ceiling. They feel culturally and politically discriminated against by the ruling Drukpas. “They don’t like us,” one young man told me. With at least 50,000 Lhotshampas becoming American citizens, it may someday be harder for the Wangchuck dynasty to ignore this difficult history. They have proudly sold themselves in the West as guardians of an idyllic Buddhist culture. The unspoken implication is that it was necessary to purge these people in order to save the last Buddhist kingdom. The Chinese destroyed Tibet, and the Indians absorbed Sikkim. Bhutanese (Drukpa) culture is unique and tough measures were needed to preserve it. Evidently, this was the former king’s cold calculus. And then again, let’s put this in perspective. A hundred thousand refugees is a paltry number compared with the number of Palestinian, Congolese, Darfuri and Bihari refugees. After all, the modern history of forced expulsions by one ethnic group against another involves millions of victims. And why are these particular refugees coming to America? If the UNHCR had never built the refugee camps, would the government of Nepal have felt compelled to give these ancestral Nepalese work permits or even citizenship? Not very likely. Isn’t this like the Israelis arguing that Lebanon, Jordan, Syria and Egypt should have absorbed the Palestinian refugees of 1948 and ‘56 and ‘67? So maybe America should have offered refuge to the Palestinians sixty years ago? But these are just teasing counter-factuals. Millions of refugees around the world remain refugees for decades or more. The story of the Bhutanese refugees is thus unusual in that it has an ending. Most of them are going to find a new home in America or elsewhere. This brings some measure of closure for the refugees—but ironically, also for the Wangchucks. They hope the unhappy story of what they did twenty years ago will disappear with the closing down of the refugee camps in southern Nepal. It is as if it didn’t happen. Now they can get on with Gross National Happiness. But there is another specter haunting the Wangchuck dynasty’s Shangri-La: globalization. Internet, television, Bollywood and rock and roll have invaded the kingdom. Thimphu has a free press. But it is a press that observes two cultural taboos: criticism of the royal family, and discussion of what happened to the Lhotshampas. How long can that last? Bhutan is a beautiful place. High-end tourists love it. Here is my revealed prejudice: I have lived in Nepal for the past four years. In contrast with Bhutan, nothing works in Kathmandu. The electricity is off as much as eighteen hours a day in the winter months. The streets are jammed with unimaginable traffic. The Bagmati River is clogged with plastic bags and other refuse. The drinking water is sickly. But in 2006 there was a people’s uprising that threw out a truly decadent and inefficient royal family. The royal palace is now a national museum. The newspapers are filled with scurrilous attacks on anything and everybody. Anyone can say anything he or she wants. The politicians dawdle irresponsibly, and the Brahmin elite shamelessly does everything it can to perpetuate a Hindu caste culture that holds the country back. Every month or so one of the twenty-four political parties declares a bandh—a strike—and the city comes to a screeching halt. Chaos reigns in Kathmandu. But I like it. It smells of freedom. And I dare say, someday the Bhutanese will get a whiff of it. Kai BirdKai Bird is a Nation contributing editor, a Pulitzer Prize–winning historian and the author, most recently, of Crossing Mandelbaum Gate: Coming of Age Between the Arabs and Israelis, 1956–1978.